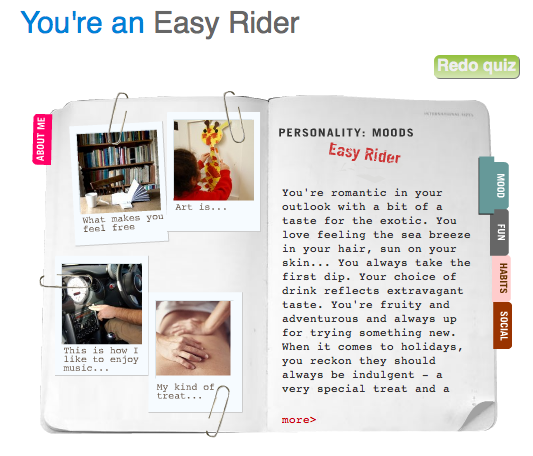 The last time I took this lovely fun test which comes dangerously close to truth was back in 2008. 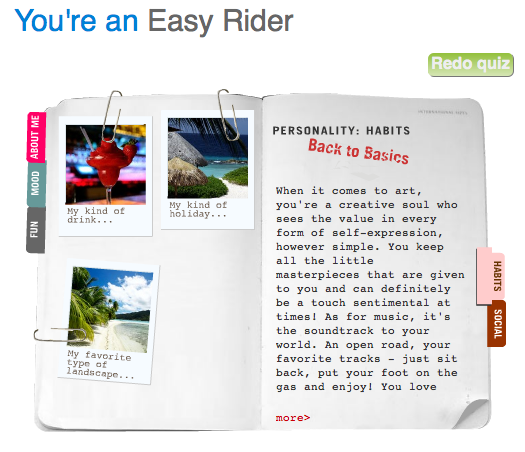 Now, after two years and much aging later, my visual dna says that am an easy rider. I think I was then too. I know I chose the same imagery for vacation, music, what I’d rather be doing right now, drink, relaxation. Am surprised that essentially, things have remained the same, despite me being the huge advocate for “being the same” is boring! So much for hypocrisy! Ok, some technical issues again, (this week has been crappy wrt all the ridiculous problems I’ve been facing technically!) and I can’t get that code to work, so am just gonna go mac crazy and take screen shots and paste it here.There’s always Plan S in my case :-)*S for screen shots. Gee, if am beginning to explain myself, I must be getting lame! ..and Oh, if you are reading this via feed, would you kindly step into my blog and vote on that little poll I have on the sidebar. If you don’t care, then that’s fine too. Bah. 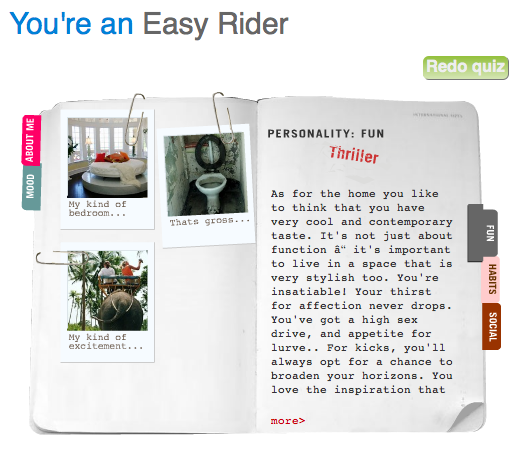 I love taking personality quizzes. It’s fun seeing how the system interprets your answers. I know they’re not that accurate most of the time . . . but hey, it’s fun. i still remember that visual dna mania back then.. good to see it back… hope things better for you, a little less hectic. I’m allegedly a wild cat.